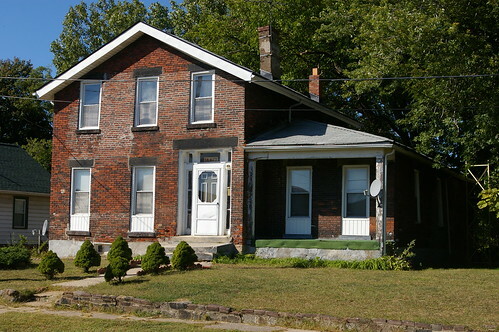 This historic brick home, the Leonard Parks residence, sits on a side street in the Collinwood neighborhood of Cleveland, Ohio. It looks, for all appearances, like a rural farmhouse built in the 1830s or 1840s. It's not on any of the major historic roads, so was it moved? From the 1858 Hopkins Map of Cuyahoga County. Used courtesy of Rails and Trails, original courtesy of the Bedford Historical Society. A quick look at the 1858 Hopkins Map of Cuyahoga County, shown in detail here, reveals that there was a house on approximately this location in 1858, on land owned by one L. Parks. Why, then, was it at the end of a dead end road - piece of land that would have definitely been less desirable? Why did the road going to it disappear soon after? Both Benjamin J. and John J. would become involved in creative pursuits. Did they choose these occupations merely because they were good trades or was there some sort of artistic tradition in the family? At present, this is unclear. Sometime between 1824 and 1834, the Farwell family moved west, from Vermont to Cleveland. Olive, born 1801 in Vermont, married Benjamin Farwell, and in 1834 their first child, Harriet S. Farwell, was born. They may have met in Vermont. Their second child, Eliza H. Farwell, was born in 1836. That year, Benjamin J. Farwell purchased 10 acres of land from Thomas McIlrath and Jerusia McIlrath, some of the earliest settlers to this area. (Cuyahoga County Recorder, AFN: 184312220001) This $400 purchase seems to indicate that he was likely having at least some success as a carpenter / joiner. (In April of 1838, Benjamin Farwell purchased more land, this time from Darius Adams and Mary A. Adams. (Cuyahoga County Recorder, AFN: 184312220002) The sale - six adjacent acres for $180 - includes the space where the house now stands. Later that year, Olive gave birth to the couple's third child, Horace W. The following year, 1839, their fourth child, Henry J., was born. 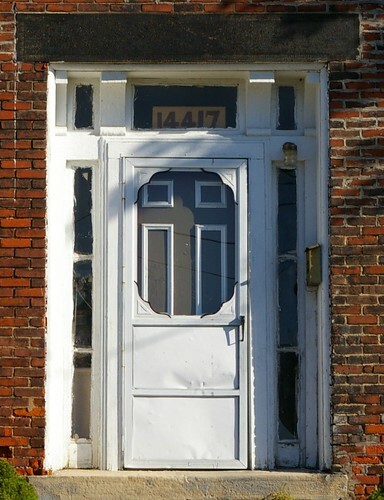 The doorway, if we ignore the newer door and storm door, looks like something that may have been built in the 1830s, perhaps by a carpenter eager to show off his skill. 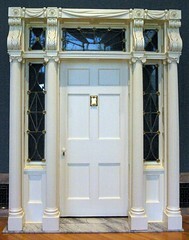 A historic photo, provided by Dan Musson of the Cleveland Landmarks Commission, shows that the bottom pane of the sidelights was originally a wood panel. This is consistent with the doors of the Brainard residence, on Denison Avenue, at left (demolished 2010) and the Isaac Waren residence, at the corner of Warren Road and Lakewood Heights Boulevard, in Lakewood, at right (demolished or moved 1938). 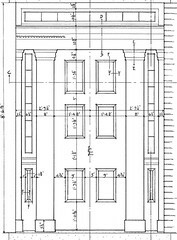 The Isaac Warren residence drawing is a detail, taken from a set of plans done by the Historic American Buildings Survey in the 1930s. Both were built at about the same time - Brainard circa 1830-1850, and Warren circa 1835. Both were of similar scale to this one. 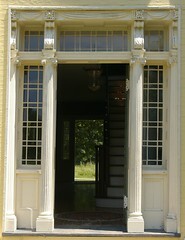 The proportions, in specific, the taller transom (the window over the top of the door) and the brackets at the top of the columns, splitting the transom in three, make me think of someting a bit grander. These two doorways were both designed by architect Jonathan Goldsmith. To the left is the one from the Isaac Gilette residence, built in 1821, now in the Cleveland Musuem of Art. At the right is the one built for the William Peck Robinson residence, in Willoughby, in 1831 or 1832. It has been moved to Hale Farm and Village. Both share grand proportions and earlier dates of construction. 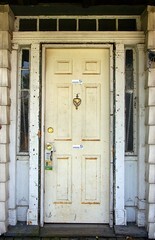 It would be worth investigating the glass in this door to see if we can determine its age. While it would be difficult to tell the difference between glass made in 1835 and 1850, it would be much easier to differential between that and glass made in the 20th century. This might help one see whether there were originally such vast expanses of glass or if they were originally broken up into smaller panes. We can be reasonably certain that there wasn't a residence on this location when Benjamin Farwell purchased the land. The current residence straddles the line between the two parcels he purchased. Further, neither of the individuals he purchased the lots from were listed as residents of Euclid or East Cleveland Townships. Benjamin Farwell did not call this house "home" for long. By 1840, Benjamin, Olive, and their children had moved into the city of Cleveland, while J.J., Rebecca, and John J. Farwell most likely remained here. (1840 U.S. Census) Perhaps Benjamin was able to find more work as a carpenter in the city. 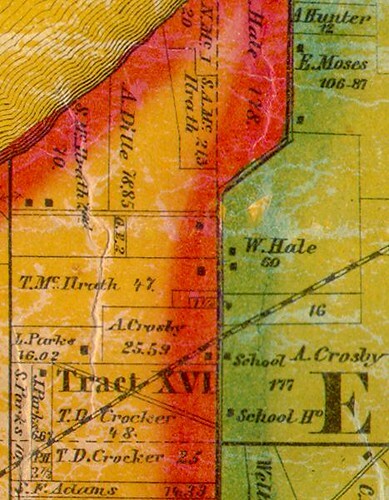 A detail from the 1858 Hopkins Map of Cuyahoga County. Used courtesy of Rails and Trails, original courtesy of the Bedford Historical Society. Oliver Emerson, a lawyer, was a relatively early settler to Cleveland. In 1830, he purchased 60 acres in Parma. It was a long, skinny lot, with frontage on Pearl Road, just south of the intersection with Snow Road. 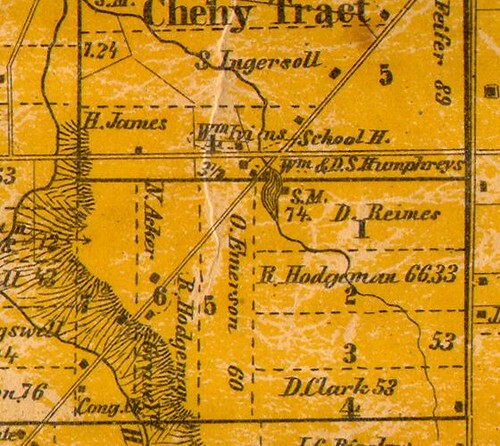 (Cuyahoga County Recorder, AFN: 183010270002) Center Creek, as illustrated on later maps cut through the northeast corner of the proptry. D. Reimes operated a sawmill on the adjacent pond. A school was located just down the road. We can be reasonably certain that Oliver Emerson was the son-in-law of J.J. Farwell and Rebecca Farwell. When Lydia Farwell married him and where she lived prior to this marriage is less clear - at the age of 23, in 1840, she does not appear to have been living with her parents. Perhaps she was in school, or perhaps she was married to another individual. This house, at 5856 Pearl Road in Parma Heights, may have been his residence. The structure, probably built in the 1840s or 1850s, is located on land that he owned. Oliver's first wife, Mindwell Emerson either divorced him or died (I can find no further record of her) sometime after 1844. (Cuyahoga County Recorder, AFN: 184404250001) By 1850, Oliver Emerson had married again, to Lydia Farwell. They remained in Parma, possibly in this house, for the rest of their lives. Benjamin and Olive's fifth child, Francis J. Farwell, was likely born in the city of Cleveland, in 1844. That year, they sold all 16 acres to Almon A. Snow for $350. (Cuyahoga County Recorder, AFN: 184405220004) We don't have any evidence to explain why the sale price of the property, which would have probably had a home on it, therefore increasing its value, would have dropped from the $580 paid a decade prior. The Farwell farm might have sold after the death of J.J. Farwell. His date of death is unclear - the only thing we can say with certainty is that it was between 1840 and 1850. His death, combined with the marriage of John J. and Mary Farwell, probably in 1844 or 1845, would have left Rebecca alone on the farm. Perhaps this was the reason they chose to sell the property. As of 1850, Benjamin Farwell had moved back to the neighborhood where he grew up, and was working as a carpenter. He was probably renting, as I can locate no record of him having owned property in the vicinity at that time. (1850 U.S. Federal Census) Ten years later, his occupation was listed as "grocer", and his son, Horace W. Farwell, was working as a carpenter and jointer. He had likely learned the trade from his father, and had perhaps taken over his father's business. I have not been able to find anything regarding the death of Benjamin Farwell's wife, Olive Farwell. She does not appear on the 1860 U.S. Census record with Benjamin, strongly suggesting a date between 1850 and 1860. In his later life, Benjamin Farwell also lived with his brother-in-law, Oliver Emerson. (U.S. Federal Census, 1880) He died in December of 1880 of "neuralgia of the heart". The funeral was held at Oliver Emerson's residence. Benjamin Farwell was buried in East Cleveland Township Cemetery. (Cleveland Necrology File, Farwell, Benjamin J.) If we were looking for the graves of other members of his family, this cemetery might be a good place to start. The Farwell family likely had a creative impact greater than we can know based on the existing record. The aesthetic quality of the doorframe, illustrated above, makes me wonder what other structures Benjamin Farwell might have been responsible for. In the next post in this series, I'll address Almon Snow, who purchased this parcel from the Farwells in 1844, and his family. GREAT RESEARCH. Thank you for sharing.